Since all the evidence to date suggests that the economy continues to improve on the margin, the FOMC (in their statement released today) is right to think that they may have to raise short-term interest rates sooner than expected. The market agrees, and that makes higher-interest-rates-sooner-than-expected virtually certain. At this point, I'm guessing that the FOMC will begin to raise rates no later than March of next year. However, at the rate things are improving, there is no reason they couldn't begin to "lift off" sooner than the end of this year. This amounts to a triple dose of good news for investors: 1) the economy is definitely improving, 2) short-term interest rates are going to rise to more attractive and reasonable levels within the foreseeable future, and 3) all of this should serve to boost optimism and reduce uncertainty about the economy's prospects. Here are some charts updated for recent announcements that are also germane to investors' decisions going forward. 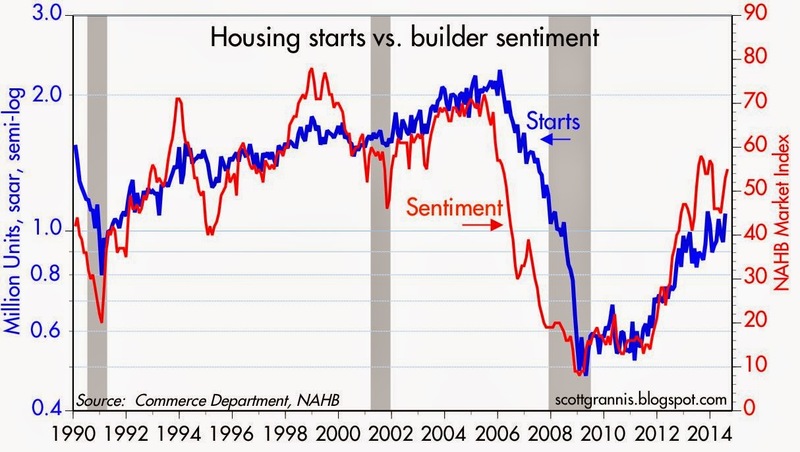 The outlook for commercial real estate looks solid, as I noted earlier this week, and the July housing starts and recent survey of builder sentiment (see graph above) released today point to continued improvement—albeit relatively modest—in the residential market. 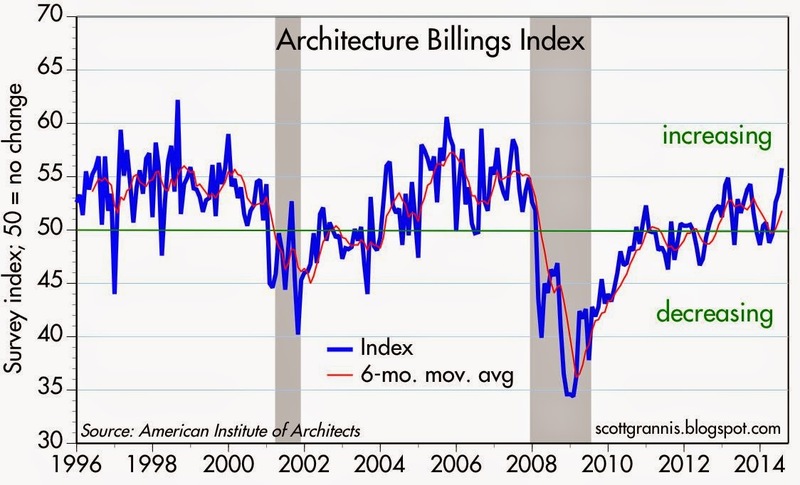 Architectural billings in July suggest that the outlook for commercial construction activity is positive and improving. Nominal GDP has been growing at about a 4% pace for most of the past four years, yet the Fed has kept short-term rates extremely low. This is unsustainable. 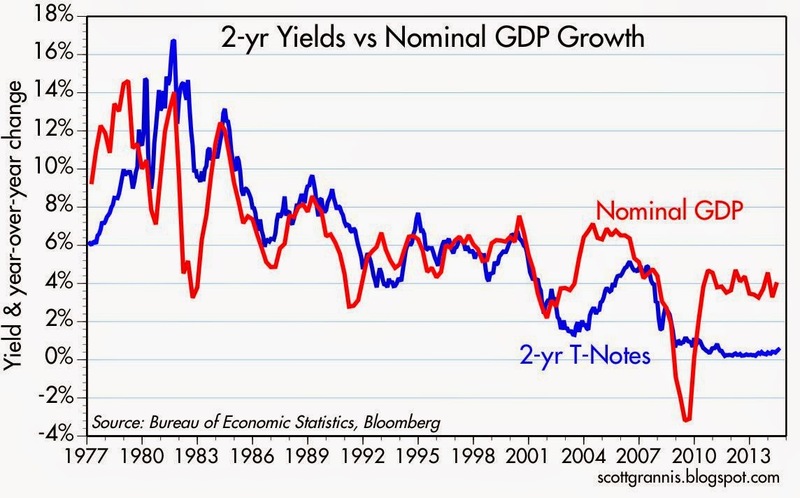 The sooner the Fed gets short-term rates back to levels consistent with 4% nominal GDP growth, the better. 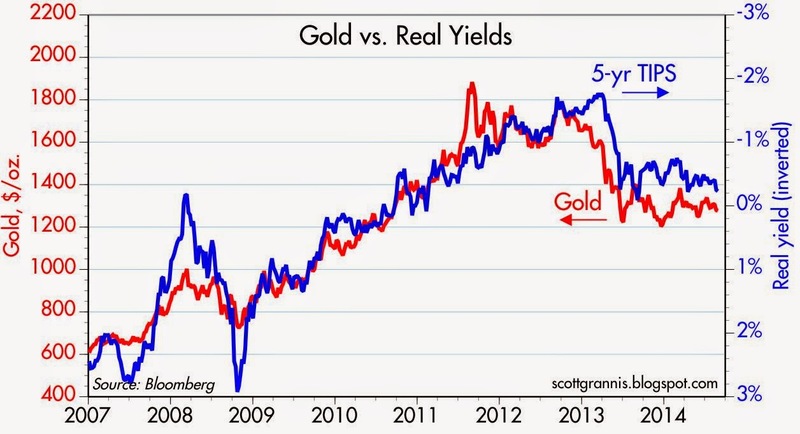 As the chart demonstrates, there is no reason to think that higher interest rates are detrimental to growth. Higher interest rates are instead a logical consequence of growth. 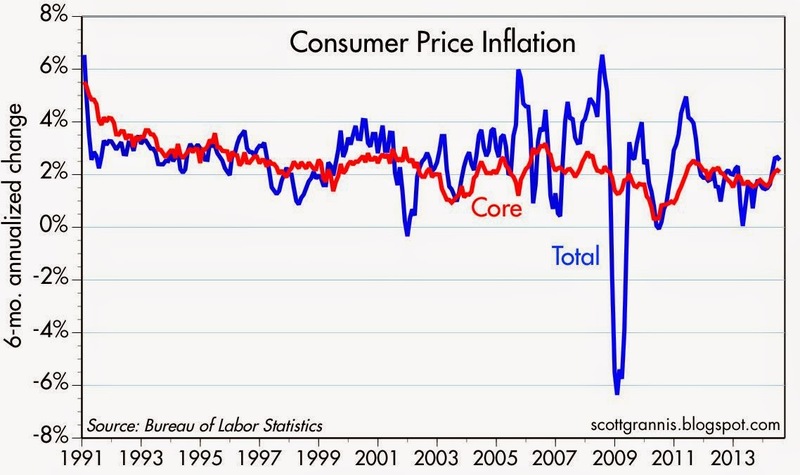 The CPI has increased at about a 2.3% annualized pace for more than 10 years. 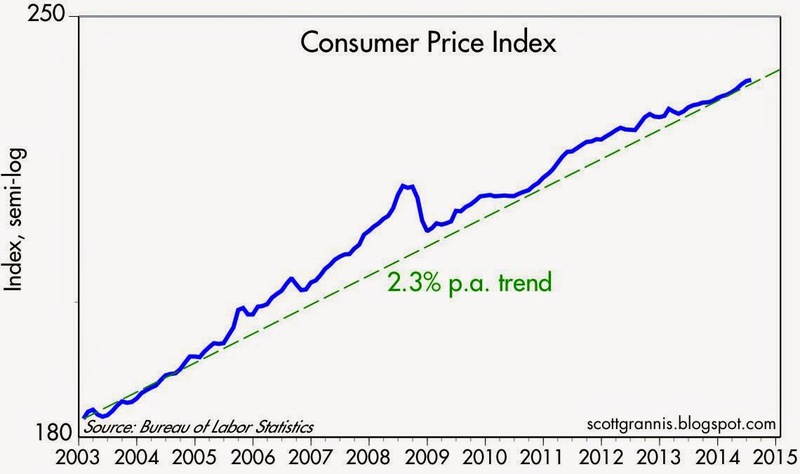 At this rate, prices increase by over 25% every decade. 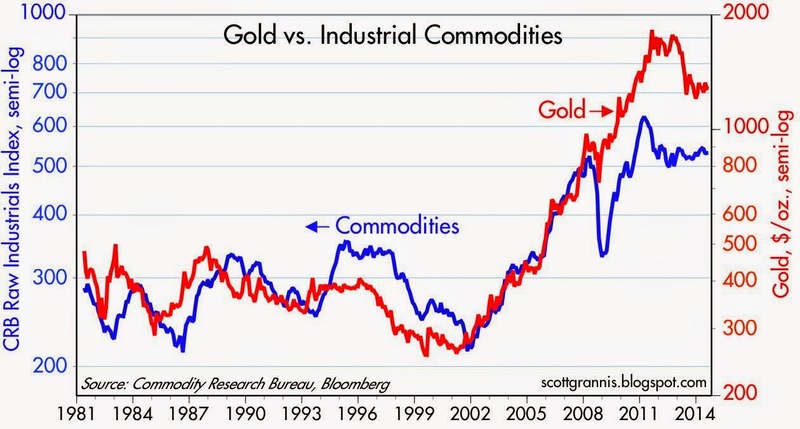 That's not insignificant, and it's not even close to deflation. It's not healthy either. In fact, it transfers hundreds of billions of dollars from the private sector to the federal government every year. How? The interest rate on cash, savings deposits, T-bills, bank reserves, and other short-term instruments is about 2% lower than the inflation rate. That means that holders of cash and short-term securities are losing 2% of their purchasing power every year, and the federal government and the Fed (which transfers any and all profits on its balance sheet holdings to the Treasury) are the direct beneficiaries. It makes little or no sense for the Fed to continue to keep real short-term interest rates in deeply negative territory. It's potentially quite destabilizing, since it encourages excessive borrowing and leveraging and speculative activity. 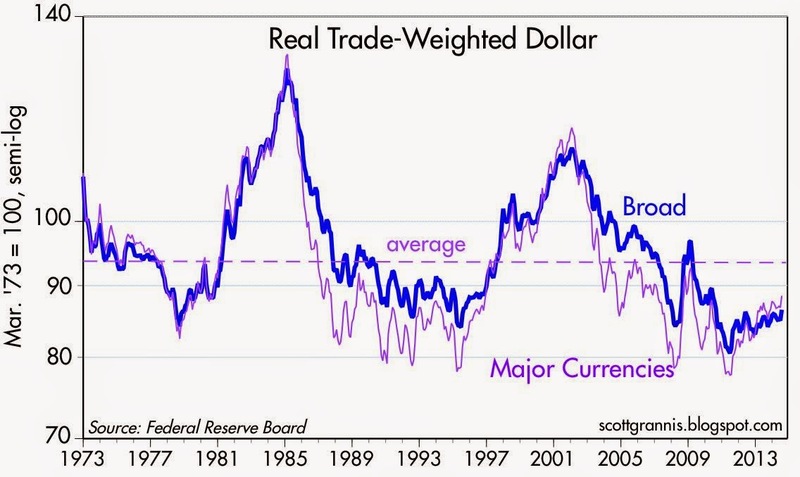 Eventually it could become a potent source of higher inflation, since negative real interest rates undermine the demand for money at a time when the Fed is still eager to supply it, and that is the classic prescription for an inflationary environment. Over the past six months, both the total and the core version of the CPI have accelerated: consumer price inflation now is running somewhere between 2 and 2.5%. With short-term interest rates pegged at 0.25% or lower, real short-term interest rates are about -2% or worse. There are at least $10 trillion of short-term deposits and securities paying negative real interest rates, which amounts to a wealth transfer of $200 billion or more from the private to the public sector. This weakens the private sector—the source of most of the economy's strength—and strengthens the public sector, which is the sector with the highest propensity to squander scarce resources. It's a prescription for chronic economic weakness. It once made sense given the public's tremendous risk-averseness and the world's huge appetite for money, but with every day that brings news of an improving economy, it makes less and less sense. 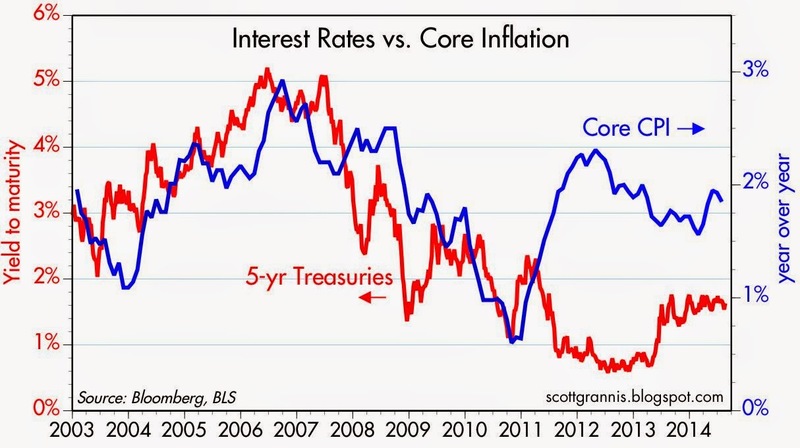 Short-term interest rates are still quite low relative to current inflation trends. 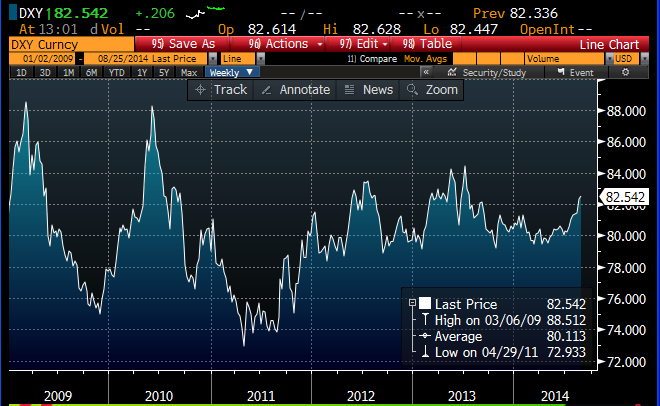 Holders of 5-yr Treasuries are losing purchasing power at the rate of about 0.5% per year. With inflation at 2%, 5-yr Treasury yields should be closer to 3%, or about double their current level. Fortunately, it doesn't look like risk markets have become overvalued—yet. 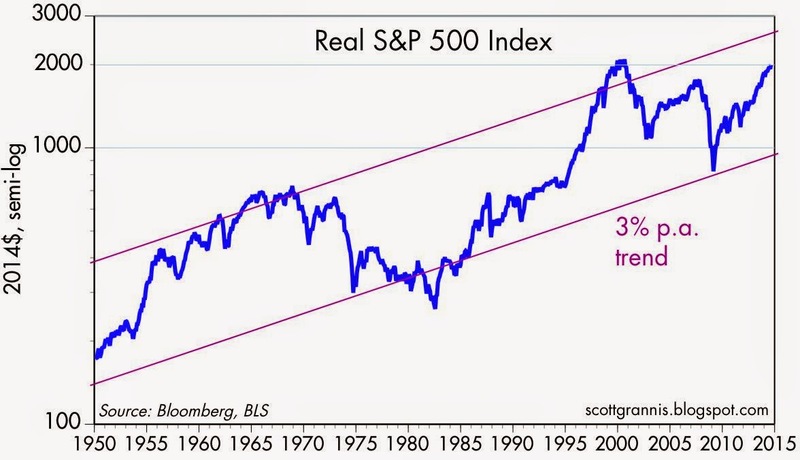 But the Fed could well find itself with this problem before too long. For now, credit spreads (see graph above) are not abnormally low, and PE ratios are only modestly above average (see graphs below). But if borrowing costs remain in negative territory—thus encouraging borrowing and leverage—the prices of risk assets could experience significant upside potential that at some point could become vulnerable to a crash. We're not there yet by any stretch, but that is what we need to watch out for. The first of the above two graphs shows the conventional measure of PE ratios: equity prices divided by 12-mo. trailing earnings. 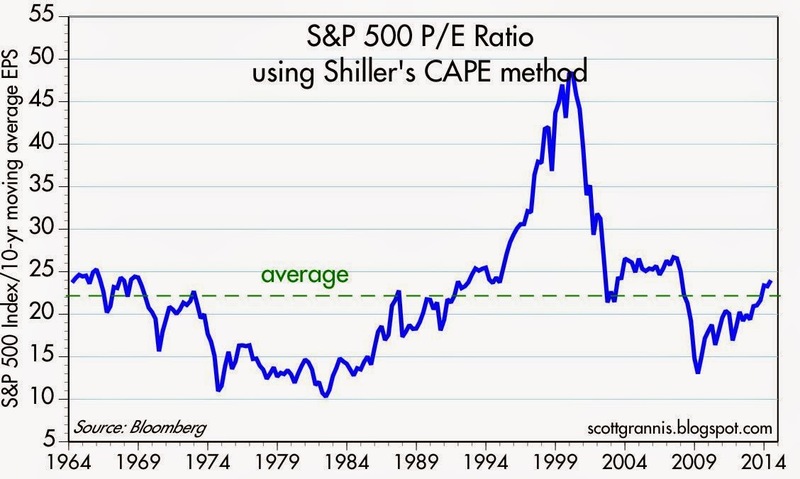 The second uses the Shiller CAPE method: equity prices divided by a 10-yr moving average of earnings. 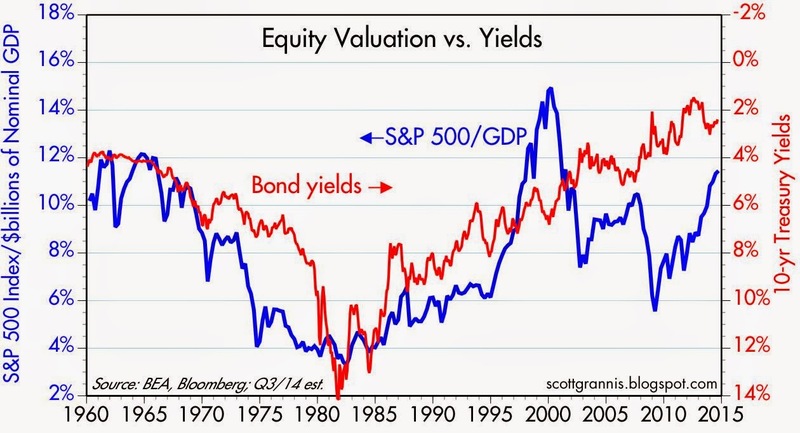 (For a more detailed discussion of equity valuations, see this post from one year ago. 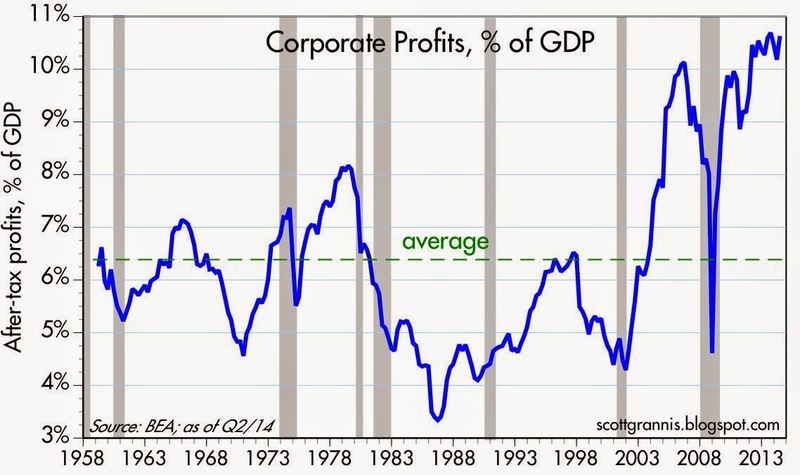 Equities are less attractive today than they were then, but valuations do not appear to be stretched or unreasonable, given the exceptionally strong performance of corporate profits since 2009.) 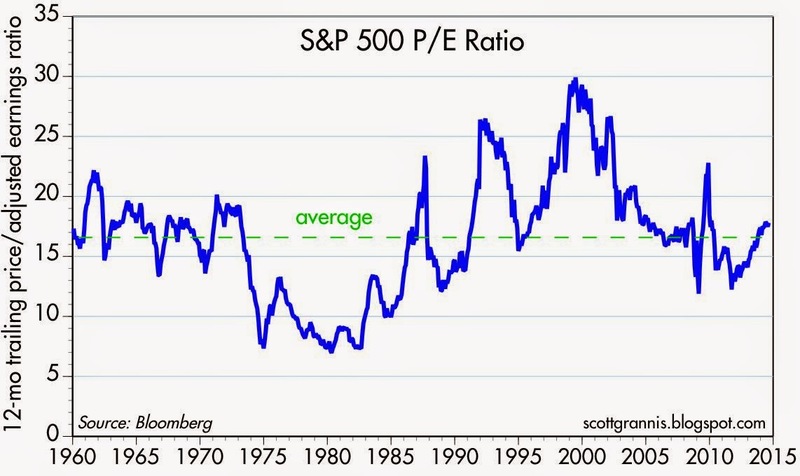 PE ratios by both measures are only modestly above their long-term averages. According to data from the CoStar Group, the commercial real estate market is enjoying very healthy conditions. Prices have been rising at a 10% annualized rate for the past five years. Sales activity was up 14.5% in the first half of this year compared to a year ago, and only 8.7% of properties were selling at distressed prices, the lowest such rate since Q4/08. It's hard to find anything to complain about here: there's been a robust and ongoing recovery in a market that was severely punished in the Great Recession. This wouldn't be happening if the economy weren't improving. 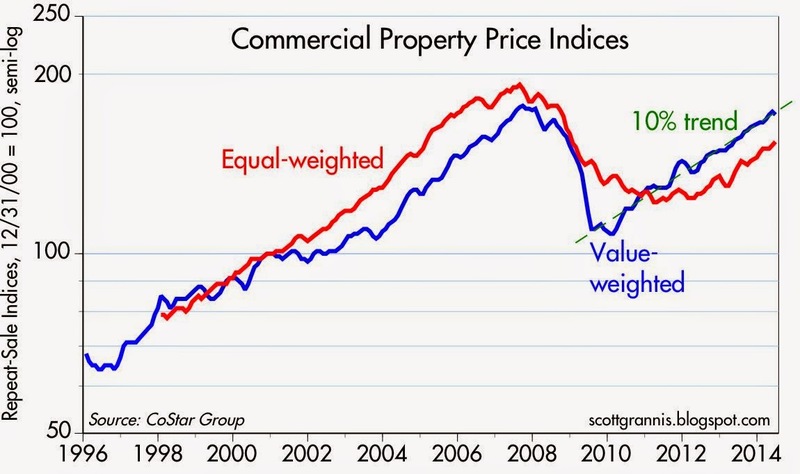 However, the strength of property prices is likely driven at least in part by easy money and low interest rates, and as such could be a "canary in the coal mine" signaling rising inflation pressures. It's certainly hard for the Fed to square this data with the need for extremely low interest rates for the foreseeable future. Meanwhile, it's a bonanza for investors in commercial real estate: 10% annual price gains plus rental income of 4% or more. That helps explain why the Vanguard REIT ETF (VNQ) has registered a total annualized return of 23% since mid-2009: back then, investors feared that the real estate market would never recover, and consequently many real-estate-related securities were trading at seriously depressed valuations. In any event, should the Fed indeed make an inflationary mistake by keeping interest rates too low for too long, investors should remember that real estate has traditionally been a good hedge against unexpected inflation. 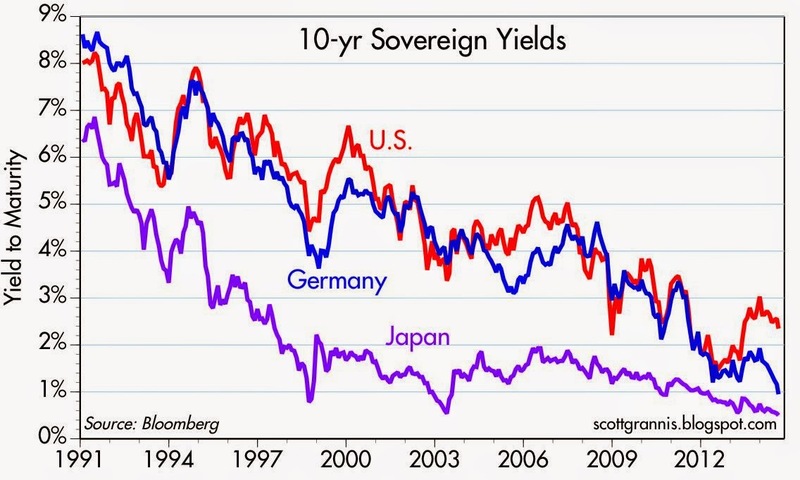 10-yr sovereign yields in Germany have plunged to just under 1%, and Japanese yields are a mere 0.5%. U.S. 10-yr yields seem to be following suit, dropping from 3.0% at the end of last year to 2.34% today. Is the U.S. going the way of Japan? 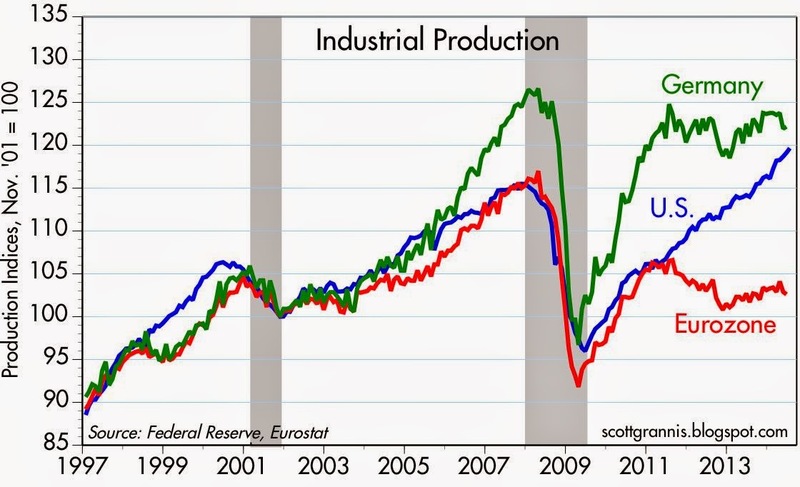 Are the industrialized economies doomed to very slow growth for the foreseeable future? The following graphs say no. The above graph shows the evidence that's grabbed the market's attention of late: yields in Germany and the U.S., which tend to move together, appear to be converging with those of Japan. German sovereign yields are to the Eurozone bond market as U.S. Treasury yields are to the U.S. bond market: the risk-free benchmark. 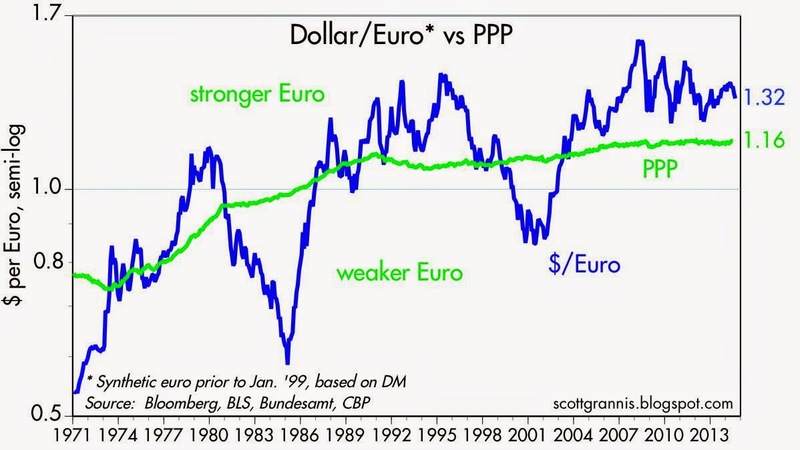 Here we see the huge difference between the strength of the German economy and the Eurozone average. Germany is being dragged down by its weak neighbors, but it is still somewhat ahead of the U.S. economy over the past 17 years. But's it's also clear that the Eurozone as a whole is just treading water, much like the Japanese economy until a few years ago, and that provides some justification for the very low Germany bond yields. But the U.S. economy has been far stronger, and continues to be, so there is little or no reason to think the U.S. yields have to converge with German yields. July manufacturing production in the U.S. rose at a strong, 8.2% annualized pace in the past six months, and has now reached a new, all-time high. 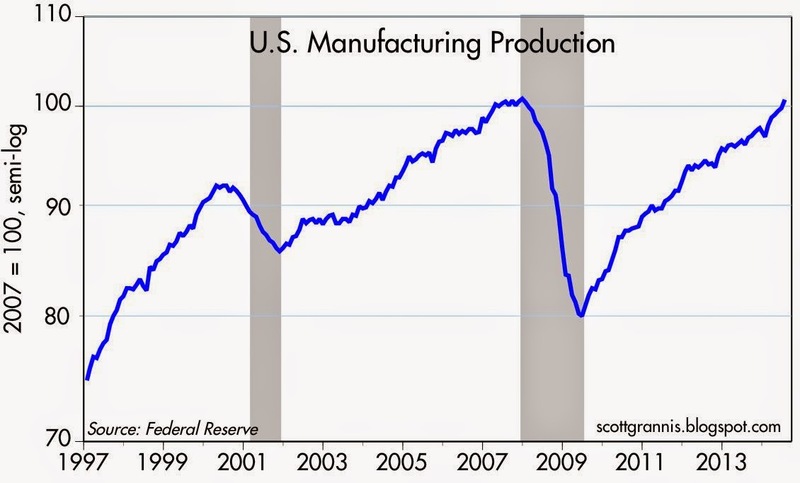 After the devastating recession of 2008-2009, manufacturing production has risen by more than 25%. It's a shame it's taken this long to recover to former highs, but the growth and improvement is nonetheless impressive. 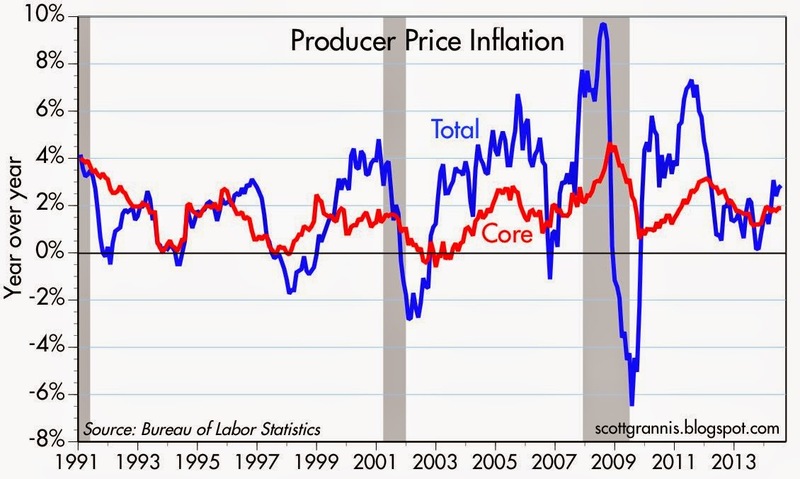 July producer price inflation is up at a solid 2-3% pace, as the graph above shows. 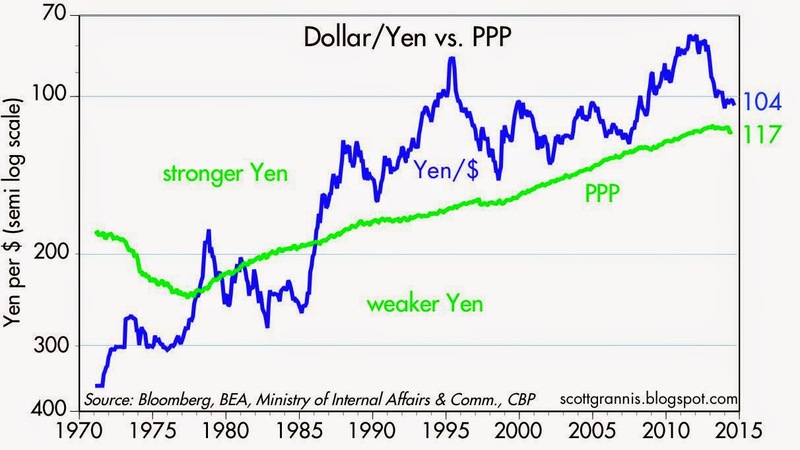 There is no sign in these graphs that the U.S. is in danger of getting sucked into a Japan-style deflation and/or stagnation. If anything stands out here, it's the relatively low levels of U.S. yields in light of the economy's strength and ongoing inflation. July retail sales came in below expectations (0.0% vs. +0.2%), but the month-to-month volatility of this series makes this fact meaningless, as the graph above suggests. Retail sales growth may have slowed a bit in the past year or so, but there is no indication of any significant decline. 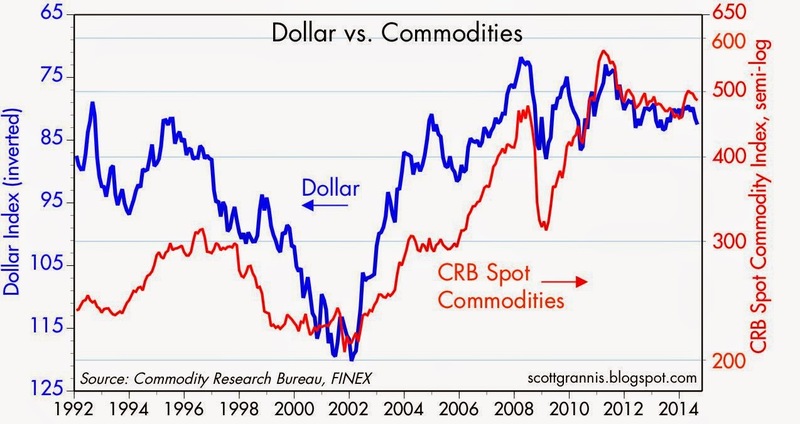 And in any event, this is not one of those series that tends to be a leading indicator. If anything, it's a good lagging indicator. Careful readers of this blog will know that I rarely feature this statistic. 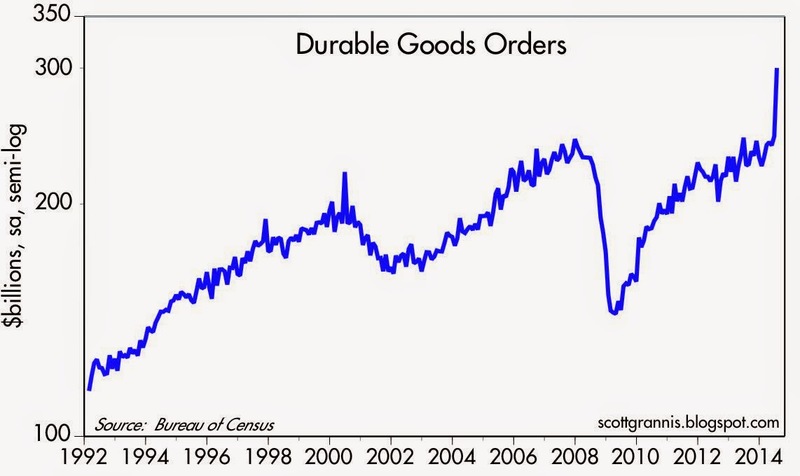 One subset of the retail sales number is the so-called "Control Group," which takes out the most volatile components: autos, building materials, and gas stations. 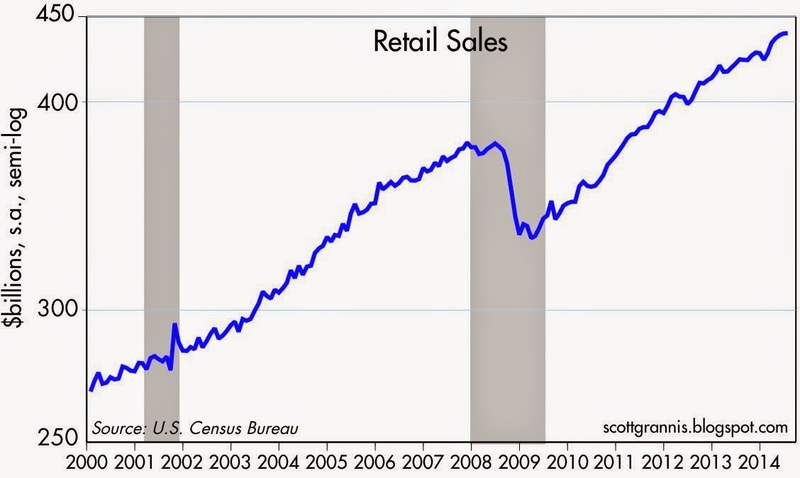 Not surprisingly, it is less volatile than total retail sales. Regardless, it too was relatively weak, increasing only 0.08% for the month. But as the graph above shows, sales continue to trend higher, but at a slower rate than in prior decades. This is the "new normal" that everyone talks about. 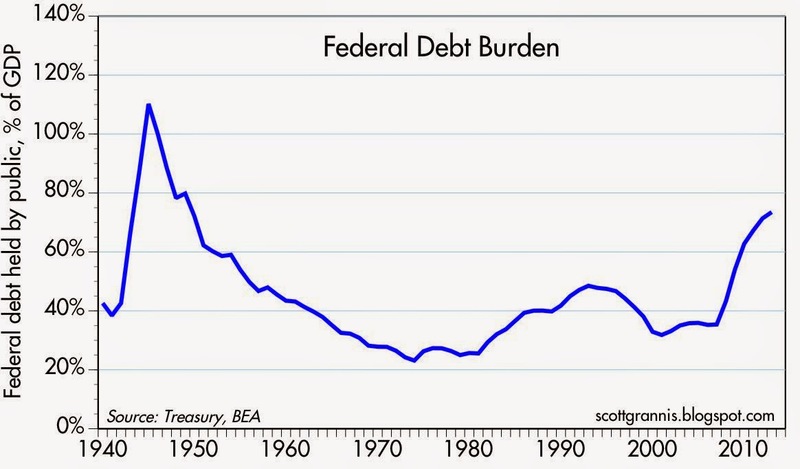 We see the same "new normal" phenomenon in the inflation-adjusted Control Group, shown in the graph above. The economy is just not growing as fast as it used to, and the apparent "output gap" continues to widen to a significant degree—currently about 15%, or a little more than $40 billion per month of sales that would have occurred if the economy were back on its long-term trend growth path. That's pretty significant: about half a trillion a year in sales that have failed to materialize. The main reason for the sales shortfall is obvious: job growth has been very modest during the current recovery, and there are still as many as 7-10 million people of working age who are on the sidelines for whatever reason. And the reason for that is obvious: business investment has been relatively anemic, despite record-setting profits. Even though capital is abundant, there's a shortage of people and corporations that are willing to take the risk of starting a business or expanding an existing business. 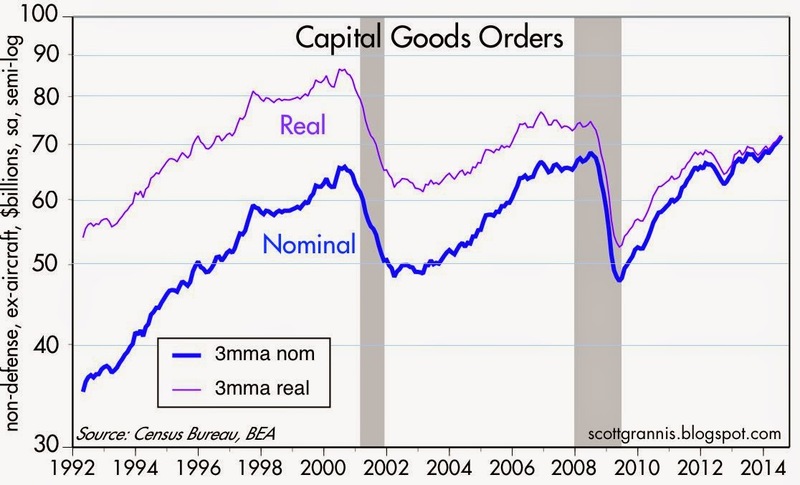 Capital goods orders, shown in the graph above, are a good proxy for business investment. In real terms, orders are still significantly below where they were in 2000, yet after-tax corporate profits today are more than double what they were back then. Without new investment in plant, equipment, machinery, computers, software, office equipment, and research, the economy is just not going to be able to grow very fast. 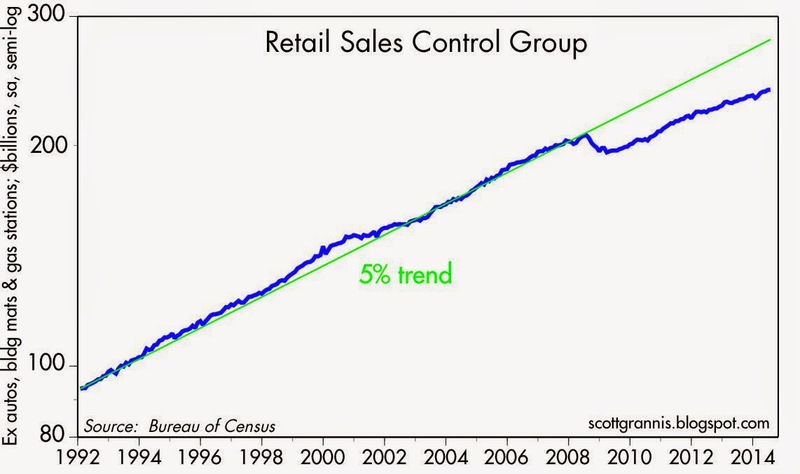 And without more people working, retail sales just aren't going to grow as fast. 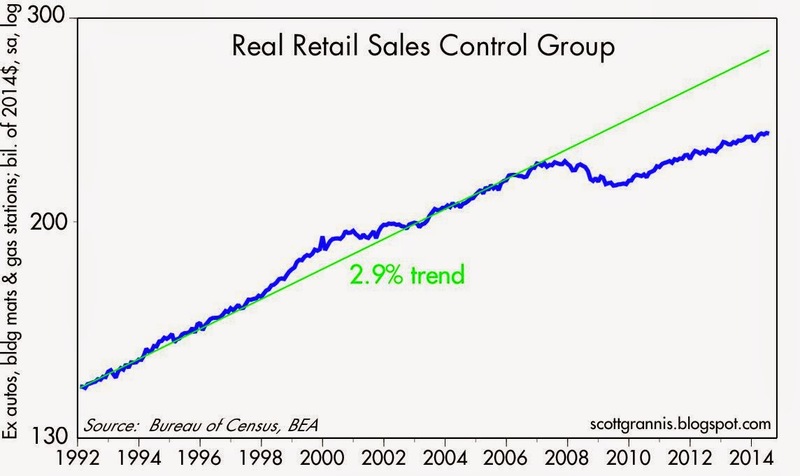 Note: as a supply-sider, I believe that more investment and more jobs are what drive retail sales; retail sales do nothing by themselves to grow the economy. It's the supply side of the economy that drives growth, not the demand side. Supply creates its own demand, to paraphrase the French economist Jean-Baptiste Say. Looked at from a global perspective, the world can "demand" goods and services only to the extent that it can pay for those goods and services. The vast majority of the world would love to buy and consume more than they do, but they lack the means. Give them a job and their purchases of goods and services will increase. And by the way, you can't augment aggregate demand by borrowing, since that only shifts the existing supply of money from one pocket to another. For that matter, all money earned (with the exception of what is literally stuffed under the mattress) is always spent: if I don't spend all I earn, then I must give my "savings" to someone else to spend, and I'll hope that he is able to spend or invest that money in a way that allows him to pay me back with interest in the future. In order to have a stronger economy, I believe that we need to do everything possible to encourage work, investment, and risk-taking. A straightforward way of doing that is to make the tax rates lower and flatter by eliminating deductions and subsidies. Lower taxes increase the after-tax reward to taking risk, and it is natural to think we would see more investment if tax rates were lower, especially today, when marginal tax rates are unusually high, especially for businesses that have to compete in the world economy with offshore corporations that pay a much lower tax rate. In addition to lowering taxes we need to reduce the costs and complexities of running a business, since that lowers the hurdle rate for new investment. Complying with today's astonishingly complex regulatory environment just gets harder and harder as the number of pages in the Federal Register expands exponentially. One thing for sure: exceptionally low interest rates are not going to stimulate more investment. The past five years is proof of that. Besides, the Fed hasn't so much depressed interest rates artificially, as it has accommodated the tremendous amount of risk aversion in the world that followed in the wake of the financial crisis and recession of 2008. Interest rates are low because people and corporations are reluctant to take risk. We've been living in a very risk-averse environment. We can break this cycle by increasing the after-tax rewards to taking risk and by reducing the regulatory burdens that plague new investment. Unless and until Washington adopts a supply-side agenda, we're likely to be stuck in a slow-growth world. Policymakers need to entrust the private sector with engineering a stronger recovery, and empower it with business- and work-friendly policies. As far as I can tell, the debate over the U.S. economy's health and growth—or lack thereof—still rages. I've argued since late 2008 that the recovery would be a sub-par recovery, mainly due to excessive government spending and inflationary/uncertain monetary policy. (See more references to a sub-par recovery here.) 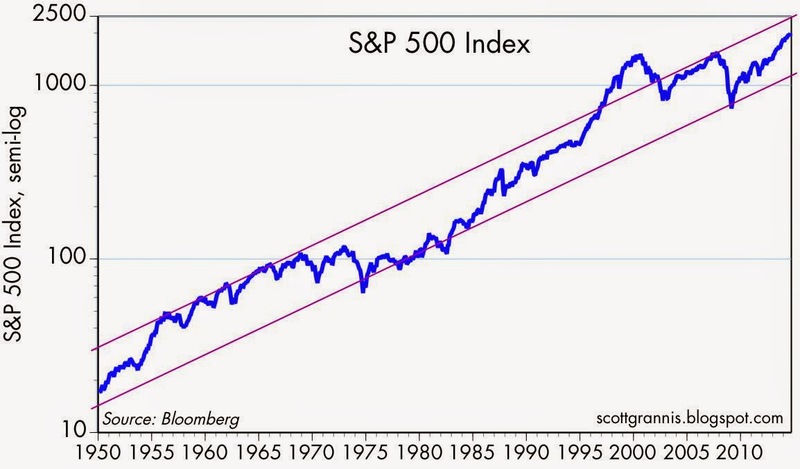 I've consistently argued that even though the economy would likely experience a disappointingly slow recovery, it would nevertheless be a better recovery than the market was expecting, and that would be good for equities. Both of those forecasts have been vindicated, even though I thought we'd see growth of 3-4%, and instead we've seen growth of only 2.1% since the recovery began about 5 years ago. Meanwhile, there is no shortage of (mostly Keynesian) economists, notably Paul Krugman, arguing that the recovery has been weak because government spending stimulus was insufficient. 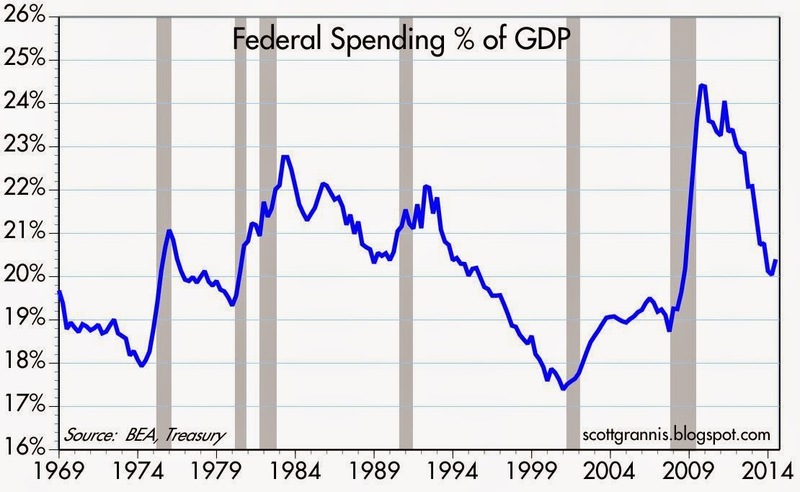 Lately, there have been a growing number of economists arguing that the recovery has been weak because of a significant decline in government spending. To me the Keynesian arguments are weak, because they all cheered the passage of the ARRA in early 2009, one of the most significant expansions of federal spending in generations. 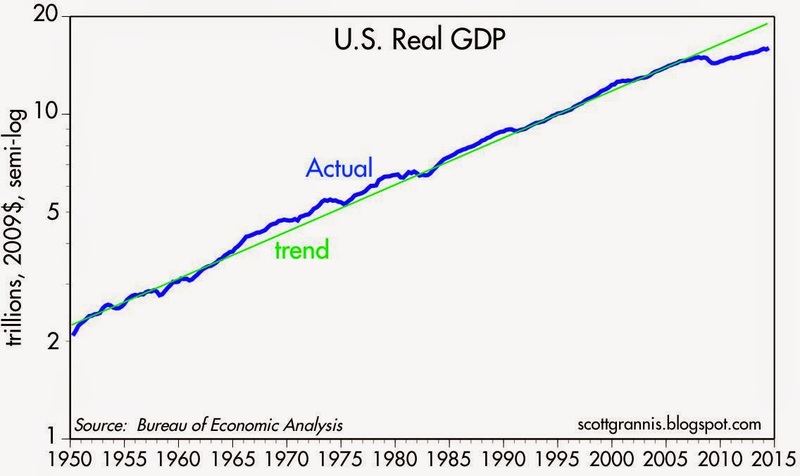 Yet regardless of whether federal spending increased or declined relative to GDP, real growth has been pretty steady at about 2-2.5% on average for the past 5 years. 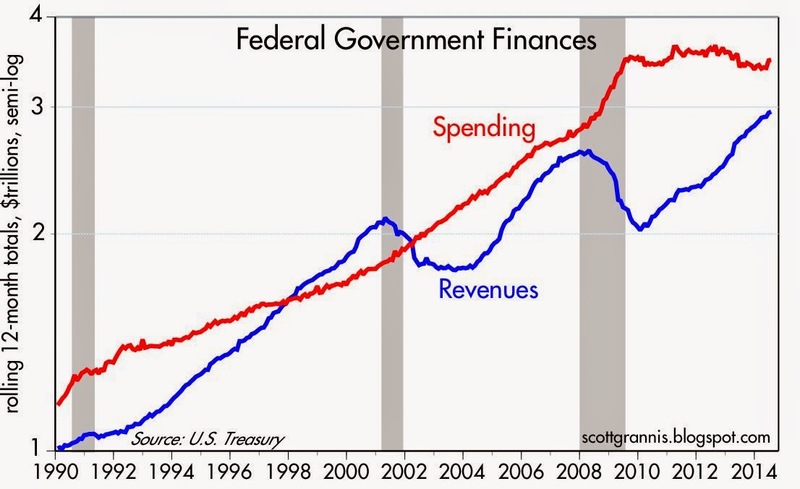 You can see this in the graphs above: despite a gigantic increase in federal spending relative to GDP in 2009, and a huge, subsequent decline in spending relative to GDP, real economic growth since 2009 has been a pokey 2-2.5% throughout. We had a similar decline in spending relative to GDP in the 1990s (though it never went so high as it did in 2009), yet economic growth averaged a solid 4% per year the latter half of the 1990s, thanks in part to lower tax rates. As a supply sider, I don't see the logic behind the theory that more government spending is stimulative and less is restrictive. How can taking money from those who are working and giving it to those who aren't create a bigger economic pie? It creates perverse incentives, for one thing. And it also channels the economy's scarce resources into the less-productive sectors of the economy. True economic growth only comes about when scarce resources are utilized in a more productive manner. I think the massive amounts of deficit-funded spending we've seen since 2008 are one of the main reasons the economy has been so weak. Bigger government is not better. With spending now having shrunk to historic norms relative to GDP, I'm tempted to say that growth has a chance of picking up. Be that as it may, it still appears that the debate today centers around the question, Is the economy growing? I think the evidence of growth is significant, even though growth is sub-par. But one sure way to tell if we're growing and prospering is to look at tax receipts. Tax receipts don't lie: they are driven by incomes and profits and the number of people working. 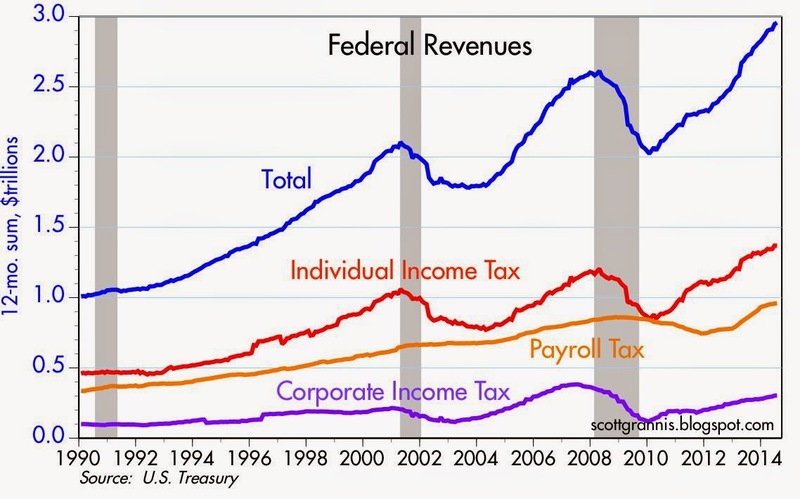 As the graph above shows, federal revenues have been rising for over 4½ years. Annual federal revenues are up by almost $1 trillion from their recession lows. They are up $365 billion from their pre-recession high, for a gain of 13.7%. Most of the gain has come from individual income taxes (including capital gains taxes) and payroll taxes. That is powerful testimony to the fact that the economy is generating more jobs, higher incomes, and higher profits. Corporate taxes probably would have contributed a lot more if our corporate profits tax weren't so high, since more and more companies appear to be avoiding the repatriation of their foreign profits. These days the government is earning 35% on lots of nothing, when instead it could be earning, say, 10-15% on $500 billion or more (of repatriated profits) per year if we had the wisdom to reduce our corporate tax rate. 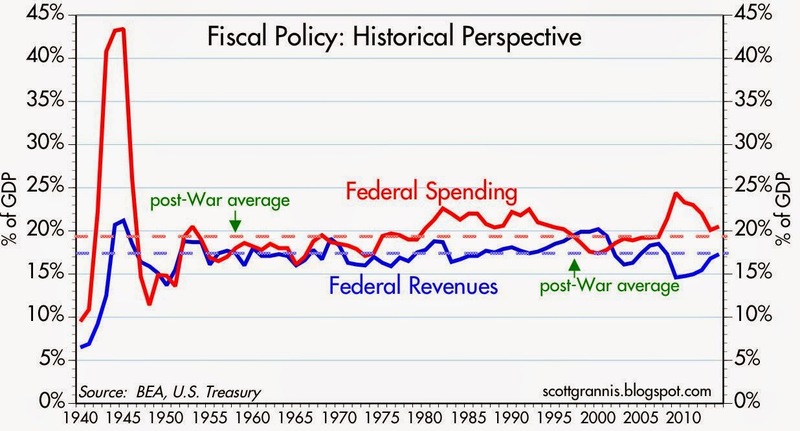 And in any event, as the graph above shows, federal revenues today as a % of GDP are almost exactly equal to their post-war average. Imagine how much higher they might be if this had been a robust recovery with lower and flatter tax rates! 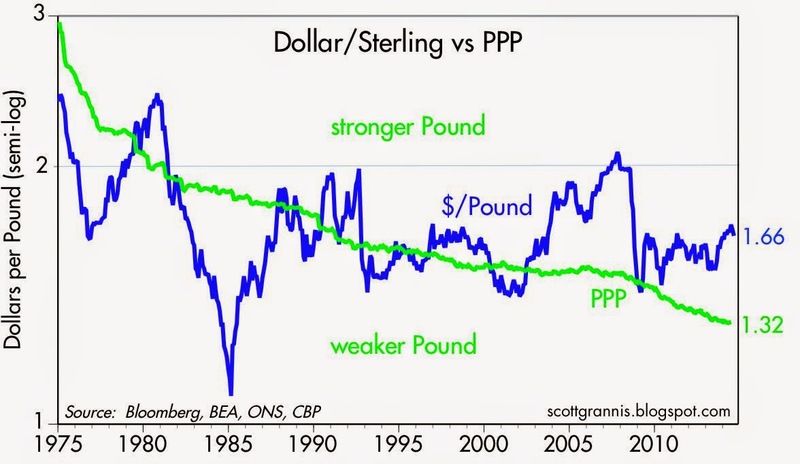 It's the weakest recovery ever, but it is nevertheless a recovery. Taxes don't lie. And it could be a much stronger recovery if tax rates and transfer payments were reined in. "Cleanse the personal income tax system of deductions and lower the marginal rate on a revenue-neutral basis." Stop taxing corporations' foreign earnings twice, and lower the corporate tax rate to a more competitive 20%. Simplify the overly complex regulations that make running a business so difficult and costly. Make monetary policy more predictable by making it rules-based. "when workers reach age 65, stop any payroll deductions and employer contributions to encourage them to stay in the labor force. Their pay will increase and they will be less costly employees. Incentives work." "We must have a robust military capability. And then we need to conduct ourselves in a credible way." 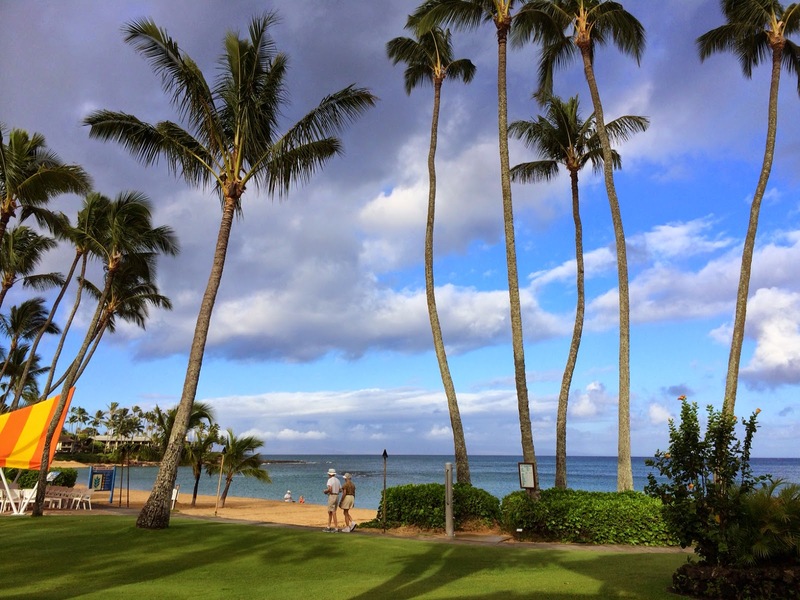 As we bask in the lovely Maui calm before tomorrow's Iselle storm, it's tempting to draw a similar analogy to the markets. 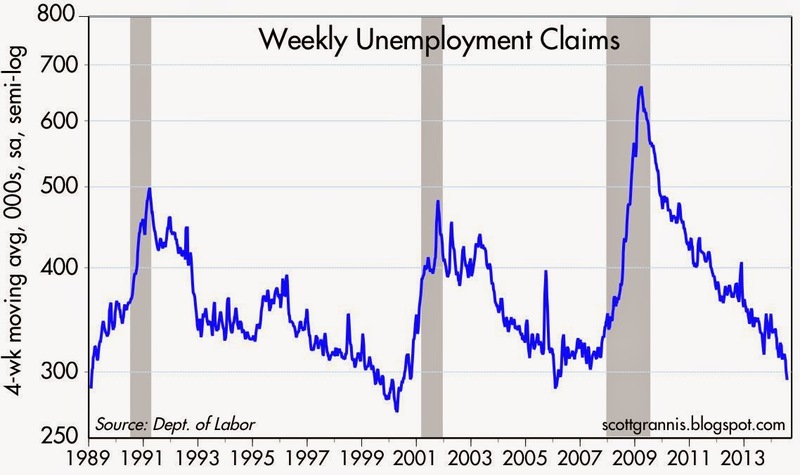 Weekly claims for unemployment are about as low as they get, and such levels have traditionally been followed by the onset of a recession; swap spreads—the most reliable forward-looking indicator of economic and financial market health—have risen 10 bps in the past month from extremely low levels; high-yield spreads—a good coincident and sometimes leading indicator of economic stress—have jumped 80 bps since their post-recession lows of late June; stocks are down almost 5% from their all-time high; and the Vix has surged from a low10.3 to almost 17. Is there a recession lurking in the wings, much as hurricane Iselle, still hundreds of miles from where we are, is bearing down on Maui? Hurricane hysteria has probably peaked, but maybe the world hasn't fully appreciated the signs of deterioration in the past two months. Let's look at all these facts from a big-picture perspective. I think you'll see that while nothing rules out an economic deterioration of sorts, there is no sign yet of the deterioration that we would need to see in advance of another recession. If there's to be a trigger for another recession, it could be that John Bolton is right when he says that "the world has descended into chaos." What's affecting the market today is not any meaningful deterioration of the U.S. economic fundamentals, but a deterioration in the geopolitical fundamentals affecting the world. 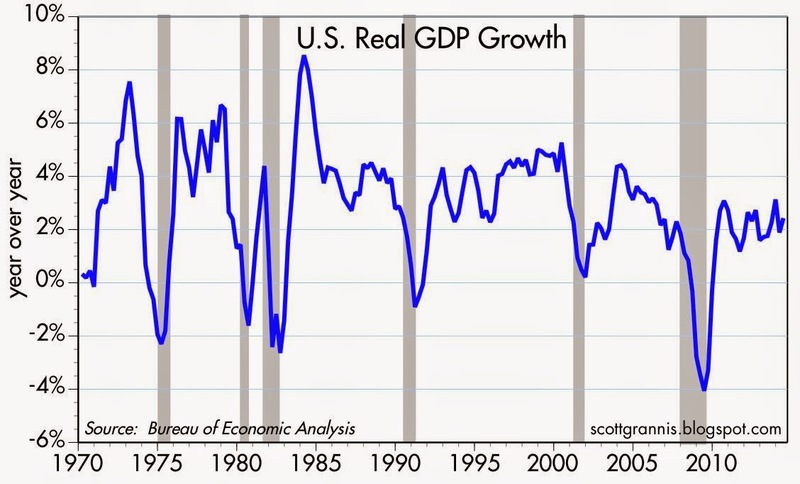 So far, the underlying fundamentals of the U.S. economy remain healthy. Unemployment claims don't get much lower than they are today. But each time they've descended to this level, another recession has been just around the corner. 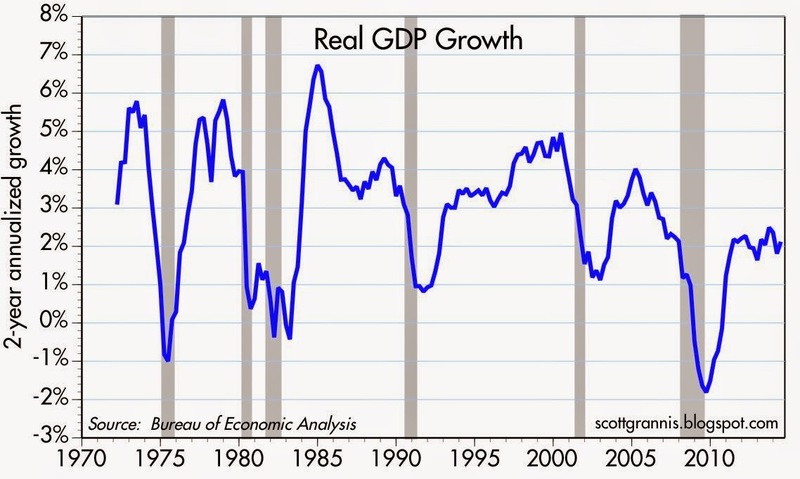 However, it's important to keep in mind that claims don't trigger recessions; bad fiscal and/or monetary policy does. Claims are what result from the improvement or deterioration of the economy. So far, the U.S. economy continues to improve. One way of thinking of swap spreads is that they are a proxy for the price that you have to pay to offload some of your risk onto someone else. They rise when big investors start getting anxious and everyone begins to feel uncomfortable with the level of risk they are carrying and uncomfortable with taking on counterparty risk. 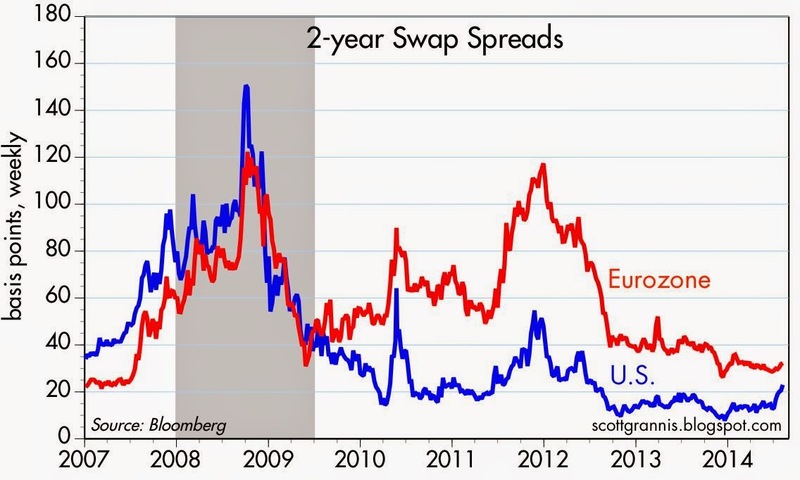 What we see in the above chart is that 2-yr swap spreads are still pretty low. In fact, for the past year or so they have been exceptionally low, and they are now back to levels (20-25 bps) that in the past have coincided with healthy, normal economic conditions. 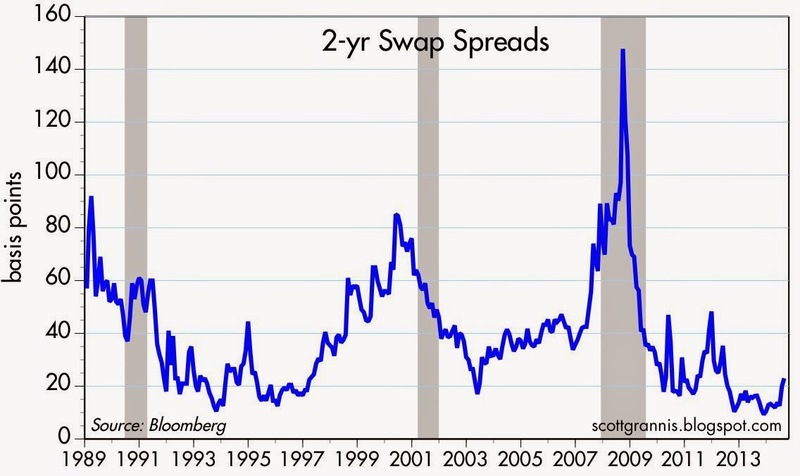 Above you see the long-term graph of swap spreads. From an historical perspective they don't indicate anything unusual going on. 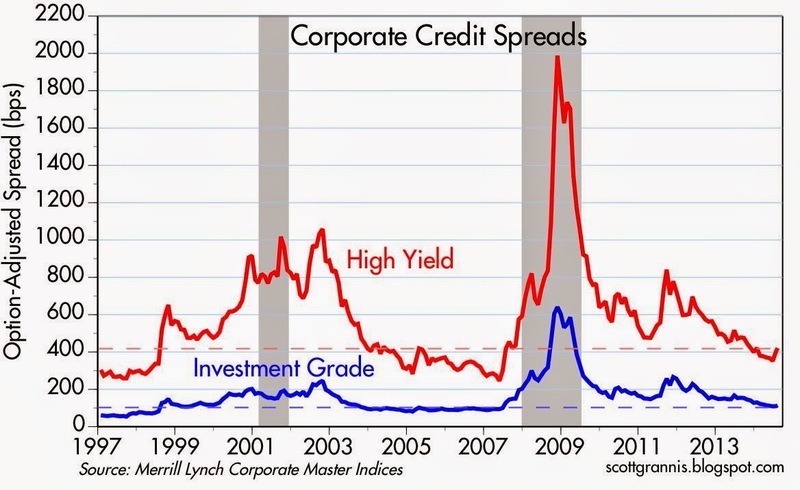 The recent rise in corporate credit spreads, shown in the graph above, hardly registers on a long-term time scale. 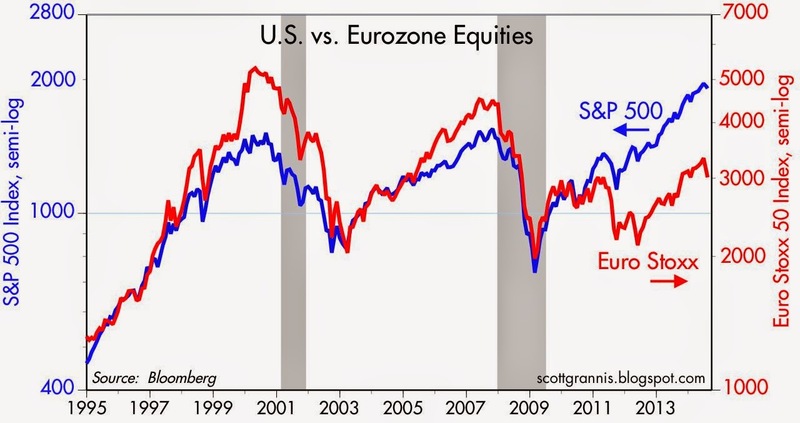 The Eurozone is nearer the epicenter of the current geopolitical crisis, so equities there have suffered more than in the U.S. The Euro Stoxx index fallen about 7-8% relative to the S&P 500 in the past two months. Europe has problems that we don't have; our economy is far less vulnerable to a deterioration of trade with Russia. If Europe deteriorates further, that will add to the considerable headwinds the U.S. economy is already facing, but it won't necessarily be a killer for the U.S. 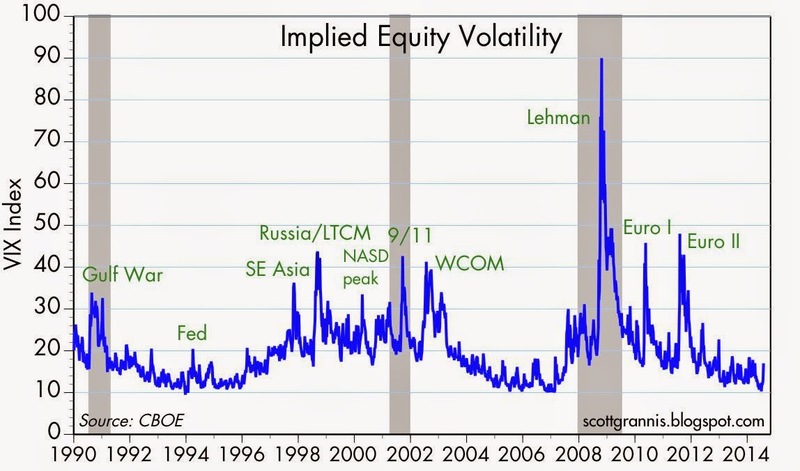 Implied volatility, a proxy for the market's level of fear, uncertainty and doubt, is still very low from an historical perspective, as you see in the graph above. So far, the current "crisis" looks like a 2.5 tremor on the Richter Scale. None of these charts looks very scary. Which is another way of saying that if you are scared of what might happen, then it's not going to cost you a lot to bail out of risk positions. Bear in mind, however, that bailing out means sitting in cash that pays you almost nothing, while risk assets continue to deliver much higher yields. Update: The Obama Administration's ongoing efforts to stop corporate "inversions" arguably represent a more serious threat to the economy than the Russia/Ukraine crisis. Obamacare was arguably the most stupid thing the Obama administration has done to date. Trying to stop corporate inversions might be the second most stupid thing. Not only are they showing themselves to be very anti-business, they are displaying supreme ignorance of how business and taxation interact. Instead of trying to stop inversions they should simply fix the tax code. But no, they want to force things to work their way, giving top priority to government's claim on profits. This will keep the economy weaker than it otherwise could have been for the next few years, because capital doesn't like to stay where it is not welcome. 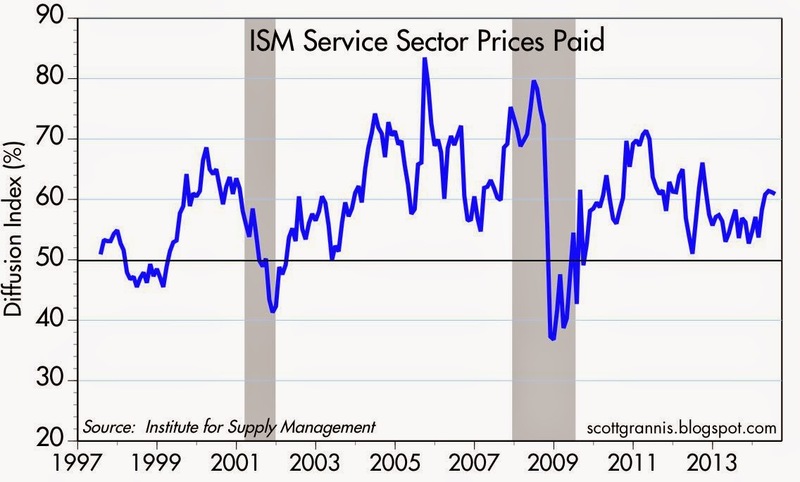 As was the case with last Friday's ISM manufacturing report, today's July service sector report was solid. 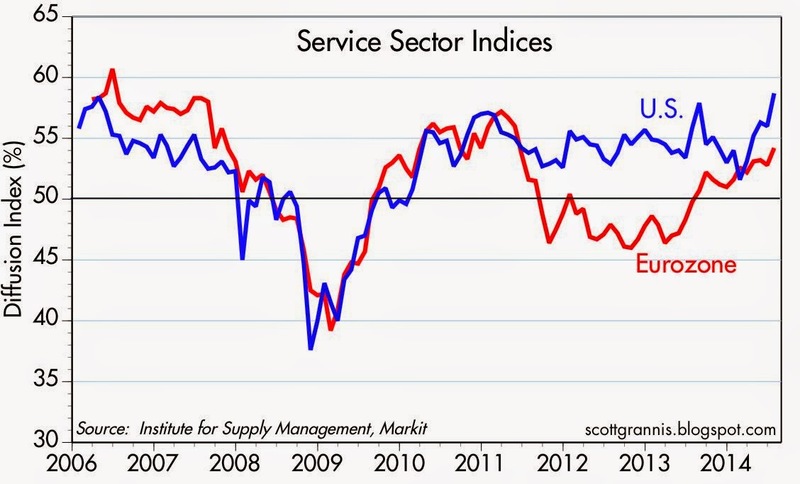 Fortunately, unlike the manufacturing report, Europe's service sector outlook is also positive. Both economies are growing and improving, and that's very good news. 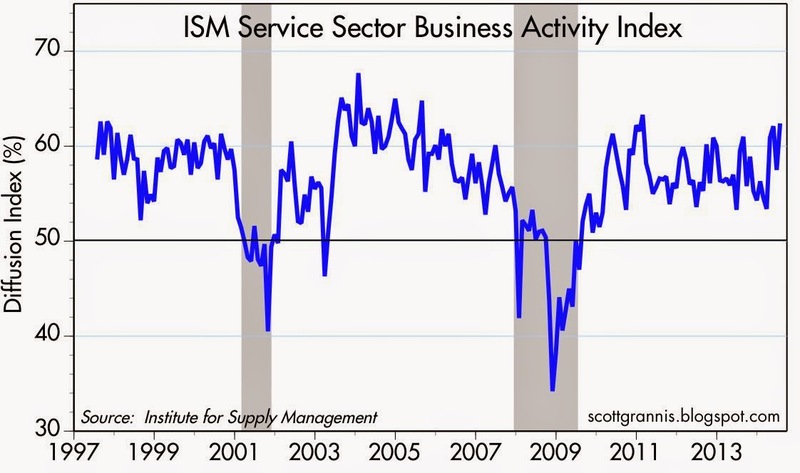 The July Business Activity subindex came in just shy of a post-recession high. The Prices Paid subindex shows little or no trace of the dreaded deflation that so many seem to worry about. The Employment subindex was also just shy of a post-recession high, and suggests that businesses are feeling more confident about the future. 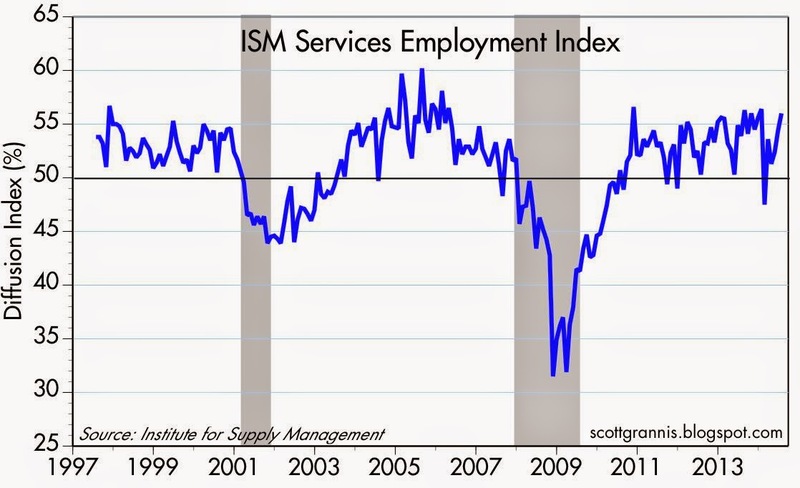 The overall Service Sector index handily beat expectations (58.7 vs. 56.5), and hit a new post-recession high. Happily, the Eurozone version of this index showed continued improvement since the end of the 2012-13 Eurozone recession. All of this adds to the already-long list of indicators pointing to continued growth and forward economic momentum. The only mystery is why the Fed feels that zero short-term interest rates are necessary to sustain and foster the growth of the U.S. economy. These graphs almost certainly do not paint a picture of an anemic recovery. Expect increasing dissension among FOMC members, and an earlier-than-expected move to raise short-term interest rates. This may prove briefly unsettling to markets, but it would be the right thing to do, and as such it would be non-threatening.